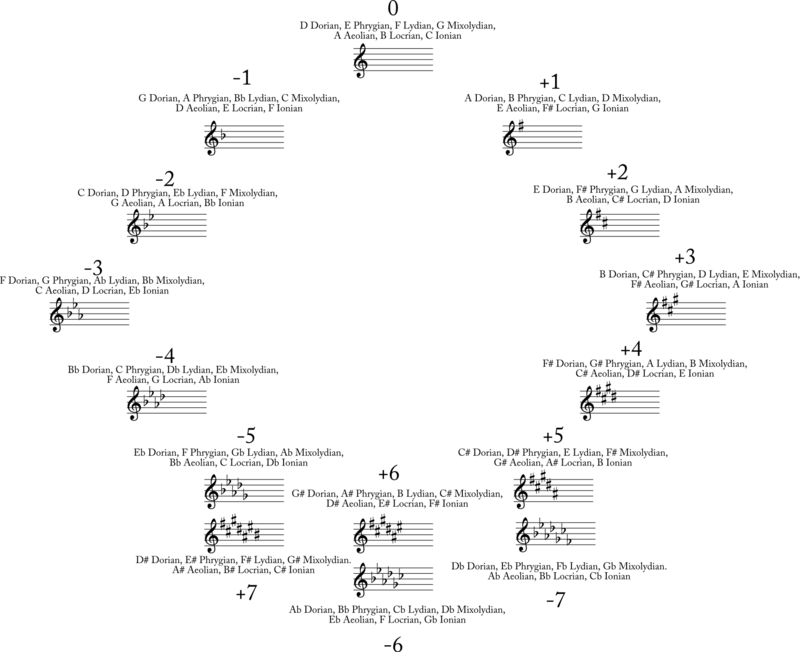 As a modal composer and theorist, known for geeking out about harmonic technique, I have always been fascinated by the way others perceive the Locrian mode. From my perspective, it is simply a mode, and one that I have been known to use on occasion in my own music—more frequently than Ionian, in fact. 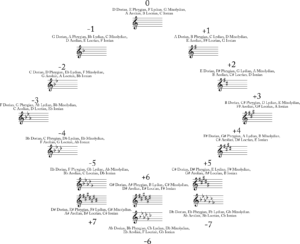 To others, however, it tends to be viewed with a sort of befuddlement, as the “black sheep” of the seven diatonic modes, due to the fact that its first and fifth scale degrees are a diminished fifth apart, instead of the perfect fifth contained in the other six modes in the series. With perhaps the exception of the death metal community, it often tends to be treated as merely a theoretical curiosity for that reason. The oft-cited reason from common practice-inclined theorists is that Locrian’s “diminished tonic” is unstable and requires resolution, supposedly rendering the mode effectively unusable. This trope is oft-repeated in theory texts, method books, and general discussions of the (diatonic) modes. Some textbooks even try to pretend it doesn’t exist. People have been bagging on Locrian ever since Heinrich Glarean (who called it “Hyperaeolian”) rejected it from his expansion of the Renaissance-era modal system in his well-known 1547 treatise, Dodecachordon. That reputation, however, is not deserved. Indeed, before the anonymous authors of the tenth-century treatise known as the Alia musica started applying the familiar Greek demonyms to the medieval catalog of diatonic modes, initiating our modern usage of them, the Greeks of centuries prior actually applied the names in a completely different order. In fact, in that system, the name “Mixolydian” did not refer to the mode we would typically think of today (i.e. G-A-B-C-D-E-F-G, and its transpositions), but what we now know as “Locrian”. (The modern use of the term “Locrian” to refer to B-C-D-E-F-G-A-B and its transpositions, per musicologist and mode scholar Harold Powers in The New Grove’s Dictionary of Music and Musicians, did not seem to come about until sometime after the eighteenth century.) It was not merely a “theoretical curiosity” to the ancient Greeks, either—we see evidence in the writings of Plato, Aristotle, and other philosophers suggesting active usage, with Aristoxenus (by way of Pseudo-Plutarch) crediting its invention to Sappho. While there is one obvious way to enforce the tonal center in the Locrian mode—the “brute force” method, by using a drone (as is the typical death metal paradigm)—this approach is very unlikely to fully dismiss some of the skepticism directed at the mode, particularly with respect to its use in the context of larger progressions, and especially ones that can serve as an analogue to the tonal idea of “functionality”. This essay is my response to this challenge. While there are actually multiple ways of achieving success here, I will detail one particular approach, which provides a framework that is of considerable use in many other modal situations. First off, I’ll remark on arguably the most biggest mistake that pretty much everyone in the “unusable” crowd makes: tertian bias. That’s a term I coined some time ago to refer to the fact that, outside the realm of post-tonal theory, there are still many that think strictly in terms of tertian (third-based) harmony, such as triads and seventh chords. Even jazz theorists resort to tertian-based kludges when confronted with the non-tertian harmonic constructs of the fusion sub-genre (the “sus”), due to the strong bias built into the ubiquitous lead sheet symbol system. While my “modal advocacy” is fairly well-known, I am also an avid supporter of non-tertian harmony and its harmonic potential, particularly within the realm of modality. Indeed, once we remove the unspoken restriction of sticking to tertian harmony, the Locrian mode’s potential comes into focus. Taking such an approach allows us to completely circumvent that supposedly problematic “diminished tonic” by finding another harmonic entity to serve as a larger gestalt representation of the tonal center in the mode. To hone in on what I mean by “non-tertian harmony”, I use the term to refer to any sort of harmonic structure that appears to be, wholly or in part, constructed of intervals other than thirds. The most commonly considered types of non-tertian harmony are quartal harmony (constructed of fourths), quintal harmony (constructed of fifths), and secundal harmony (constructed of seconds), but mixed and other structures are possible as well. The distinction between these types does start to break down once enough notes are accumulated—for instance, a chord consisting of all seven notes of a heptatonic mode could be considered a tertian thirteenth chord, but it could just as easily be stacked up all in fourths, as a secundal cluster, or any other combination of intervals, for that matter. The distinction between these types tends to make more sense when dealing with smaller chords, particularly in the range of three or four notes. 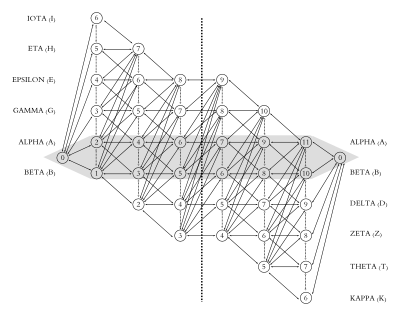 The result of stacking the Locrian mode in fourths, over its tonal center. Now, it may be useful to get into a little bit of terminology, so we can get a little more of an idea of what we are doing within this expanded harmonic realm. My personal system I use for labeling harmonies in this environment is something I call “Arabic numeral analysis”. It bears some resemblance to the more familiar Roman numeral system, but strips out the tertian bias that permeates that system through and through. This approach immediately pays off when we start looking at non-tertian chords. Let us consider, for instance, the three-note quartal stack B-E-A. If we are in B Locrian, since B is scale degree 1, E is a fourth above B, and A is a seventh above B, the Arabic numeral symbol would be 1(4/7). If we were in C Ionian instead, since B would be scale degree 7 there, the chord would be 7(4/7) in that particular case. 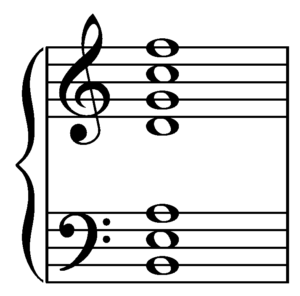 In E Dorian, it would be 5(4/7), and in C♯ Locrian, it is also a 7(4/7). Analyses of the 4/7 chord B-E-A in several modal contexts. 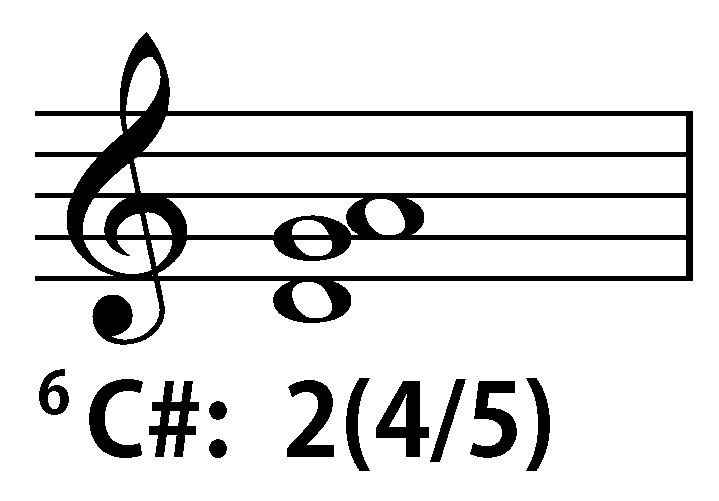 Similarly, the mixed chord A-C♯-D, in the context of E Dorian, would be 4(3/4)—A would be scale degree 4, C♯ is a third above A, and D is a fourth above A. 4(3/4) chord in E Dorian – an example of a “mixed” harmonic species. There are a number of other nuances to consider with this system in order to gain a full understanding of it (particularly with dealing with alterations, and the whole matter of how this system wreaks havoc on the common practice notion of chord inversions), but this information should be enough to process my demonstration below. CPID (“Cupid”) Model on B Locrian. It is instructive to first take a look at the norms of common practice tonality through the CPID model. In cadential gestures that return back to a tonic (1) chord, we most often find the dominant (5) chord, which exists in a distal relationship against the tonal center. Occasionally, however, one may also encounter a leading-tone chord (7) used in a similar “dominant function” capacity, which would exist in a proximal relationship with the center. The next most common pre-resolution chord (“pre-dominant” in tonal terminology) in a common practice environment would be the subdominant (4) chord (in the case of the plagal cadence), which would also be distal to the center. From this, we can surmise that our tonal center is generally preceded by a chord built on a distal or proximal scale degree—go big or go (not far from) home. Going farther back to pre-dominant function chords in a common practice tonal environment, we find that those are also typically either proximal (ii/ii°) or distal (IV/iv). Additionally, there is the matter of pitch inventory between the chords. In many cases in the common practice era, particularly when the chord before the tonic—the dominant function chord—has a seventh, the parent scale structure is actually completed or nearly completed between just it and the resolution chord. Counting the tones in both chords, the V7 resolution to I/i includes all notes in the scale except scale degree 6, and the vii°7/viiø7 resolutions include every note. This element of contrast also plays a role in the sense of harmonic motion. We have already noted the fact that the Locrian mode produces a tritone-free stack of fourths, up through seven notes. This gives us a good starting point for how we might produce seemingly stable progressions in the mode, and avoid the aforementioned pitfalls that have prevented many from seeing the mode’s viability. Speaking as a modal composer, familiarizing oneself with the harmonic potential of an unfamiliar mode in a sort of “sandbox” setting—including its vast array of non-tertian resources—can be a very useful way to get one’s bearings. For myself, this acclimation has usually come from some combination of “theorizing on paper”, and actually playing around with that theorizing through improvisation, such that the sound and idea of the mode can start to be internalized. This becomes increasingly useful—and rapid—once one has an educated sense of what to expect from a given mode under different harmonic scenarios. 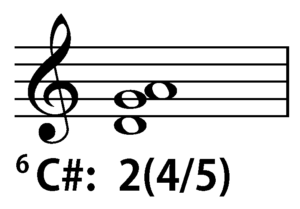 First off, let us begin with a four-note quartal stack for our chord on degree 1 (C♯), giving us C♯-F♯-B-E. In our Arabic numeral analysis system, using the most condensed method (in which compound intervals are collapsed down to their simple equivalents, and duplicates are ignored), both of these chords would be 1(3/4/7) chords. The latter, curiously enough, looks like a traditional seventh chord, in which the fifth has been swapped out for a fourth. 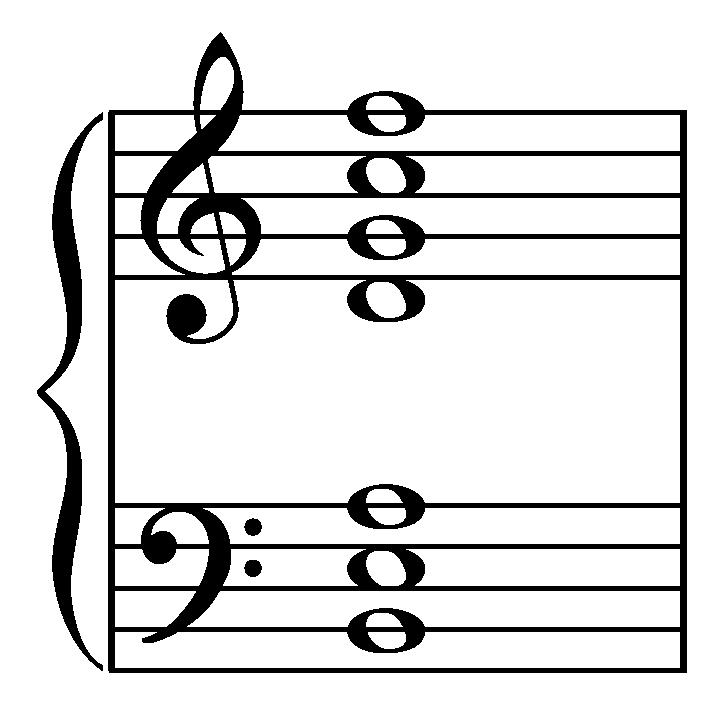 If we subtract the tones of this chord from our parent mode, the resultant negative space consists of scale degrees 2, 5, and 6. If we simply stack these in order, using scale degree 2 as the bass, the result is a 2(4/5). Again, this happens to bear some superficial resemblance to a triad, but with the third swapped out for a fourth. Having the fourth in place of the third goes a long way toward avoiding the previously mentioned pitfalls here as well. Notes needed for mode completion shown with filled-in noteheads. As you can see (and hear), the voice leading between these two chords is very smooth, and there should be some sensation from the listening example of the 1(3/4/7) chord, and its C♯ bass, seeming rather stable in this context. If we return to the CPID model, and the idea of chords with proximal and distal bass notes as potential dominant analogues, we have some other options to consider as well. Perhaps the most promising of these is by swapping out the proximal 2(4/5) for a distal 5(2/5) chord by changing the bass note from D to G, coupled with the bass reinforcement on the 1(3/4/7). Progression 3 examines this possibility. Progressions 4 and 5 explore the alternate possibilities for proximal (7) and distal (4) motion, respectively, while also offering scale completion (albeit with tones in common with our 1(3/4/7) chord). The alternate distal option (Progression 5) has a dull, rough sound, in large part due to its inclusion of a displaced cluster (a compound second and third from the bass) and the presence of the sixth. After evaluating these possibilities, I felt most drawn to extending Progression 3, with the 5(2/5) chord, into a larger progression that evokes an analogue to functionality. If we consider a rather common tonal progression—I-vi-ii-V-I—we find that under the CPID model, it produces the pattern C-I-P-D-C. Progression 6 also follows a C-I-P-D-C bass pattern, but in the Locrian mode and with non-tertian harmonies. The use of the Locrian mode and non-tertian harmonies as in Progression 6 would be pretty far off the radar of conventional thinking, for a situation where “functionality” can exist. However, it should seem as if there is a strangely familiar sense about these progressions. That is, ultimately, the goal of an effort such as this one—to show one of many accessible ways of traveling into the (surprisingly) still open musical frontier of modal and non-tertian harmony. 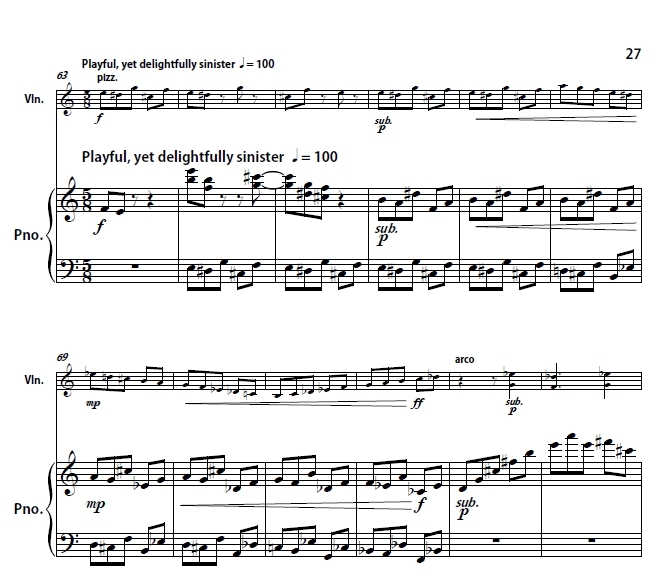 I am pleased to announce that my brand-new Piano Trio No. 1 has just been selected by fEARnoMUSIC as the winner of their recent call for scores, and will be added to the program for their upcoming Locally Sourced Sounds concert, which will be taking place on January 22nd, 2016 at 7:30pm at The Old Church. Tickets can be purchased via Brown Paper Tickets in advance, or at the door on the day of the show. My trio will share the program with works from four other Oregon composers, David Bernstein, Andrea Reinkemeyer, Ryan Francis, and Texu Kim. After a successful premiere this Sunday in Corvallis at Oregon State University, violinist Wyatt True and pianist David Servias will be taking my Violin Sonata No. 1 and the Oregon Multimedia Project pieces of my fellow UO alums Ben Krause and J.M. Gerraughty to Beall Hall at the University of Oregon in less than 24 hours. The performance will start at 7:30pm PDT (UTC-7:00) Tuesday, and for those of you who can’t make it to Eugene, the UO School of Music and Dance will be live-streaming the concert. The link to the live-stream can be found here on the official event page. (Direct link here.) The program, which includes some notes on the pieces from the violinist, can be found here–my sonata is first up. Additionally, KLCC, the NPR affiliate in Eugene (89.7 FM) will be airing an interview with Wyatt True at 12:50pm PDT about the project. For those of you outside the KLCC listening area, there is also a streaming option for you there as well. 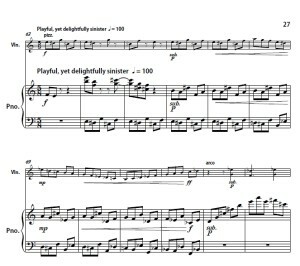 Also, a little preview of the score . . . this is out of the third movement. Now that the academic year is over, I’ve had a chance to work a bit further with Modal Utilities, which is presently carrying the internal version number of 0.2.3. After an arduous battle with the UI, I believe I’ve gotten the main Mode Calculator module close to where I want it. That includes the implementation of the transformation buttons and a scrolling transformation history box, building in some of the theoretical apparatus I detailed in my conference paper from March (which I’ve also been working to turn into a publication). As you can see in the above image, the Transformation History details the currently shown mode of D Mixolydian (4D, to use my superscript notation) was reached by virtue of the ↑3 transform on D Dorian (1D). I’ve moved the Series Info boxes off this module, as they didn’t fit very nicely with some of the new additions, so they will likely end up being spun off to a new module. 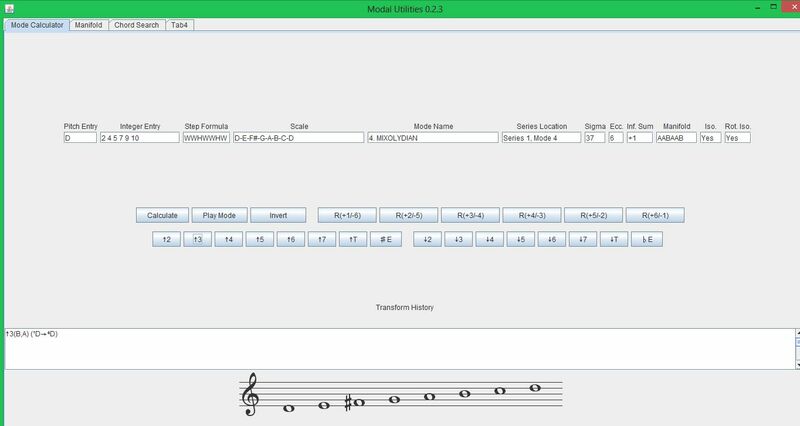 The second tab also happens to now show a functioning and interactive Heptatonic Manifold (shown below with Mixolydian mapped out on it). It’s still in a limited state right now–I’ve done a little work with allowing info from the Mode Calculator to transfer over to the Manifold module, but it’s not particularly reliable yet. 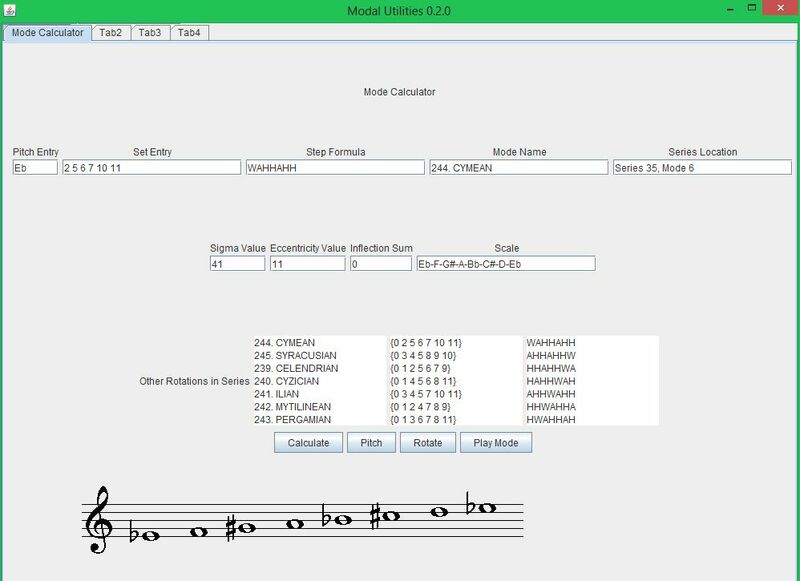 There’s also a third tab that now has a label on it–the “Chord SearcH’ module, which will eventually allow for examination of harmonic possibilities within the various modes, working with my Arabic numeral labeling system (which saw its debut in my MM thesis analytic paper in 2006). I’ve coded out a lot of the logic that will be necessary for it to work, and have had success testing it in the console, so it’s mostly going to be a matter of working up a good UI for handling that information. Likely, once the manifold/calculator module interactions are solid, I’ll roll the version number up to 0.3.0, and it’ll be close to the point at which beta testing may be viable. As far as the compositional side of things, I have a few projects going, and some upcoming events. October 25th will bring the premiere of my Violin Sonata No. 1, Op. 52 down at Oregon State University in Corvallis, with Dr. Wyatt True and Dr. David Servias. My friends and former UO colleagues Jason Gerraughty and Ben Krause will also have works on that program. I’m also working with another group of composers in Portland on a project that will result in a performance in the near future, and will have more to announce on that at a future date. Thanks for reading, and stay tuned for more details on Modal Utilities updates and upcoming performances. I’ve also started sneaking some score samples onto the Music page, if you’re curious to get a sneak peek at what some of these pieces look like on the page. Over the past few months, I’ve had an ongoing side project. 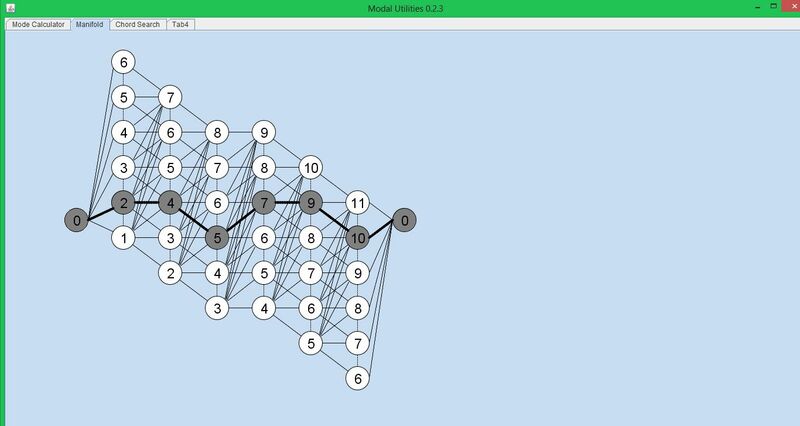 I have been developing a Java program called Modal Utilities, designed for the speedy identification of heptatonic modes. 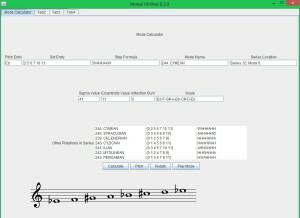 Upon entering the step formula or pitch class set of a mode, Modal Utilities will give you the catalog number and name for the mode out of my heptatonic modal catalog, the mode series to which it belongs, several other useful properties (sigma values and series eccentricity–more on those later), and the data for rotationally-related modes in the same series. 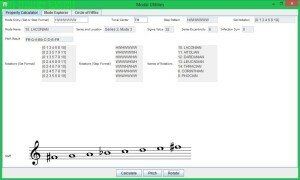 If you also insert a pitch to act as the tonal center of the mode, the program will spell out that mode from that point, give you the relative key signature (“inflection sum”) and give you a staff representation, to boot. 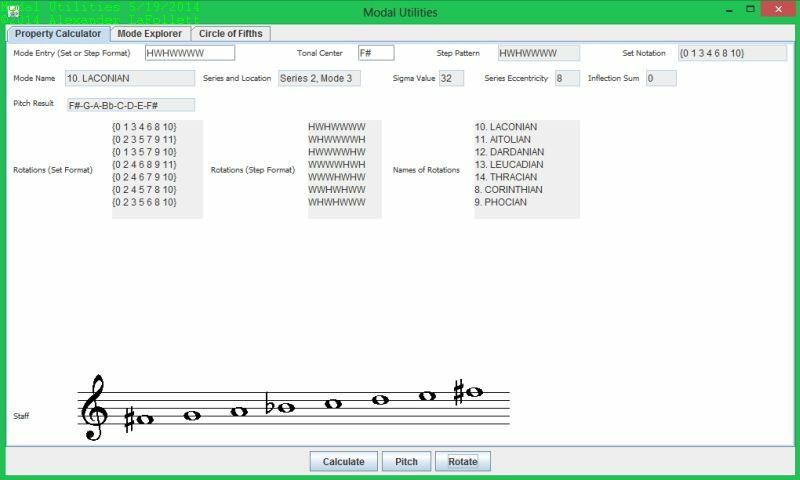 As of tonight, Modal Utilities reached Version 0.1.5, with improvements to the GUI, and the addition of the “Rotation” button, which will rotate the mode up through its series. Still quite a way to go with this project–those other tabs you see at the top are non-functional at the moment–but it should give you some idea of where this project is headed. It’s designed to be a supplement to my long-running plans to codify my (rather heretical) brand of modality in book form, a project which has progressed quite a bit of late. I’ll have more about Modal Utilities and the other theoretical developments in the near future. Stay tuned. I’ve done a little further spring freshening on the site, including a rather thorough layout rework on the Music page. Far less cluttered-looking, and the recordings I have are more easily found. I’ll probably continue to tweak it in the next couple weeks, now that this quarter is coming to a close at the college. 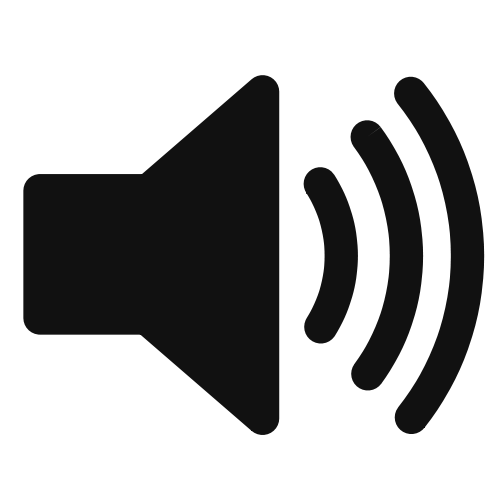 Speaking of recordings, I’ve also just posted the recording of my String Quartet No. 12, which was commissioned and premiered by Third Angle New Music this past year, as part of their New Ideas in Music (NIIM) competition. They’re really a phenomenal group, and I especially enjoyed working with them. The impromptu “mini-symposium” that sort of came about with the other finalists during the few days before the concert made it all the more enjoyable. They’ve done another edition of the competition this year, and will be premiering six more new quartets this May. I am drafting up a few things regarding my compositional approach–both in general, and with specific pieces–that I will be posting up here in the coming weeks, so I hope you’ll check by here again in the near future. Things have been relatively quiet here with the site in recent months, in part because life’s been a bit hectic in other quarters. The marathon Ph.D program is done, and since then, I’ve been keeping busy with my teaching duties, trying to find something full-time, and working on getting my modal theory (or at least part of it) into an initial publishable form. With a few new recordings rolling in, including the reading session of my periodic table-inspired dissertation with the UO Symphony, I started tweaking some things on the site, and will continue tinkering with it in the coming weeks, all the while adding more content, and trying to make this a more interesting place to visit. Speaking of ye olde dissertation, the readings of Lithium and Beryllium are now up here, and on my recently revived SoundCloud (which, until a few days ago, only had my recording experiments with a cello I tuned down a full fifth). I got decent takes of Nitrogen and Neon as well, which I hope to have up in the coming days. My thanks to Maestro David Jacobs at the University of Oregon, and all the UO Symphony musicians for spending quite a bit of time on the piece, and to my former teacher David Crumb for taking on the rather active celesta part. The next step there will be finding an opportunity for an official “premiere” of all 10 elements pieces I’ve done thus far (Hydrogen through Neon). I’ll be posting more about the process of writing that project in the near term. Other projects I have going on right now include a violin sonata I’m very close to finishing for Wyatt True, and I’ve also been working sporadically on a thirteenth string quartet and a third volume of Modal Preludes. I’ve also gotten an official “contact” page up here now, in case anyone might have interest in collaborating or acquiring my freelance services, which include composing for concert idioms and media, arranging, orchestration, engraving, and private composition study.